Developers will need to get their applications certified before being able to get into the Windows Store. Windows 8 applications rely on Metro design guidelines. This post will provide some guidelines. These are some basic ones worth repeating. You will need the latest version of Windows 8. On 6/4/2012 that would be Windows 8 Release Preview. Before jumping into the test, let's review some of considerations a developer should be aware of when trying to enter the Windows Store. There are a variety of tests around the application manifest file. A little background on the application manifest file. When building Windows Metro style applications, Visual Studio will automatically create the application manifest for you. Visual Studio 2012 provides a Manifest Designer. It will be included in the root of the project. It is simply an XML file. There is a GUI editor for editing the application manifest file (Manifest Designer). 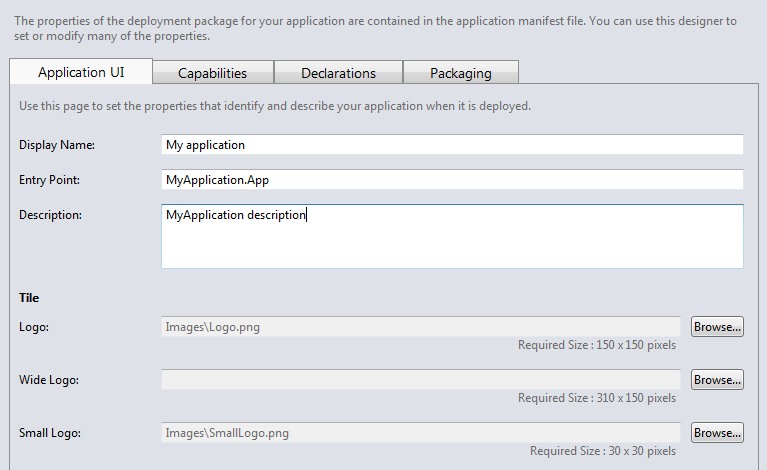 The application manifest describes your application package. Tab 1 Application UI Use this page to set the properties that identify and describe your app when it is deployed. This is about the user interface. You can specify the friendly name for your application, logo, start page, toast notifications, splash screens. Tab 2 Capabilities Use this page to specify system features or devices that your app can use. Developers can specify what capabilities of the underlying OS that an application can make use of. The developer can provide read/write access to the user's document or picture libraries, allow enterprise authentication, define inbound and outbound Internet connections. Also, think about hardware access, such as microphones, web cams, removable storage, GPS. Tab 5 Packaging Use this page to set the properties that identify and describe your package when it is deployed. The entries here are mostly for the developer, such as specifying the version number, the package name. But there are also entries that affect the user, such as Logo and Package Display name. Although this is not the complete list of requirements, I wanted to iterate through a few of them. There are some obvious ones, like your add must provide a unique, creative value, or some utility of some kind. You should be able to skim through the list below to get some ideas about things you should be thinking about. The trial app must reasonably resemble the full functionality. You are limited to "one tile"
Ads cannot execute code not provided by the ad provider. Low power computers typically respond slower. Your app must perform well, regardless. Your customers must be offered an opt-in consent for any information that will be used or shared. An opt-out policy must also be made available. You must provide the "Support contact" info field of the "Description." I am not a developer so I can only question. I am hoping that the certification process is rigorous to prevent malicious or amateur programming. For example, it says "Your customers must be offered an opt-in consent for any information that will be used or shared." when it gets to Microsoft is someone running the app through all of its various features and checking packets and verifying that in fact it exclusively only uses opt-in? Will Microsoft actually guarantee that all the information is exclusively opt-in, or is the certification process a simple automated check that relies on the content producer to affirm that they are not going to do anything bad in which case we won't really know until someome reports a bad app.